I've recently moved offices and rejoined the gang at Roof Unit. Roof Unit is a shared office space and studio for creatives in East London. Originally set up by Toby Smith in 2005, I was based there for a couple of years until spending the last year working alongside with my friend Richard Hadley. However when Roof Unit made the move to a gleaming new space in Bethnal Green with 20 desks, a photo studio and a sun-drenched roof terrace I decided it was time to rejoin my old friends, make some new ones, and settle back in. There's a great bunch of photographers working here so be sure to check out their excellent and diverse work. And under the direction of Toby Smith and Alexa Montgomery there will be a program of events running throughout the year - so please drop in if you see something of interest. 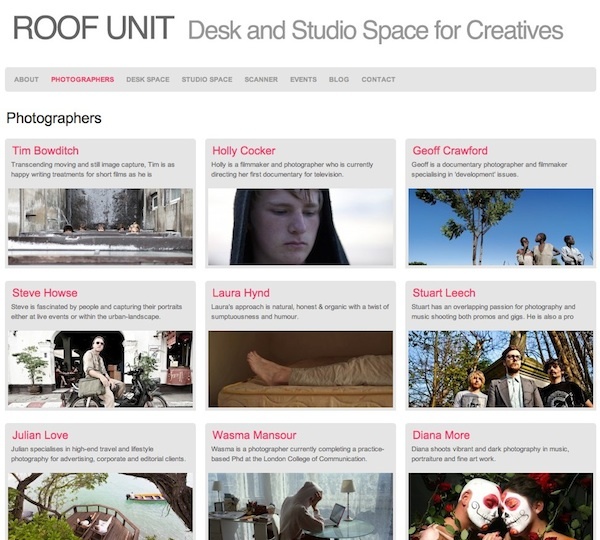 Learn more about Roof Unit by reading the recent features about the space in the British Journal of Photography and spoonfed.